Olympic Forest Park covers an area of about 680 hectares. Olympic Forest Park is a large garden-park featuring traditional Chinese gardens and mainly manifested in its natural landscape and vegetation. Olympic Forest Park is also a green protective screen between downtown Beijing and the peripheral regions. The unique garden design of the Olympic Forest Park won the first prize for City Green Space of the International Landscape Architecture Prize held in Torsanlorenzuo, Italy, which is the first time for a Chinese garden design work to have won this prize. 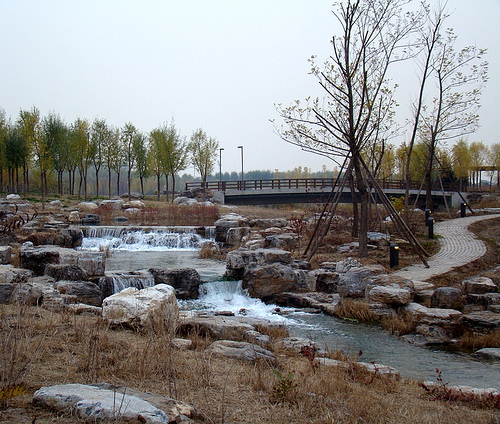 During the Beijing Olympic Games, the Olympic Forest Park serves as a green gift to delegations, athletes and the IOC officials – the back garden of the 29th Olympic Games. Location: To the north of Olympic Green Central Zone, to the northern and southern side of Northern 5th Ring Road, Chaoyang District. Take Subway Line 8 to Olympic Forest Park Station.